A Monitoring Relay is a protective control device. 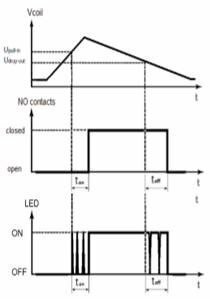 The basic functions are to receive input signals, monitor and determine them, and output an alarm signal if a set value (threshold) is reached. Monitoring Relays monitor power supplies (voltage, current, power, phase), temperatures, and other analog signals and detects abnormalities in machines and equipment by determining values against alarm thresholds. Voltage monitoring relay with optional delay-on and delay-off timer function offers a very small hysteresis (difference between pull-in and drop-out voltage). The relay is equipped with a LED which indicates the status of the relay contacts and activation of the time delay.